Home decorating and DIY projects aren't my strong suit. However, I'm really good at copying what other people do - does that count? With that in mind, I'm asking for help from all you crafty, creative people in blog land. 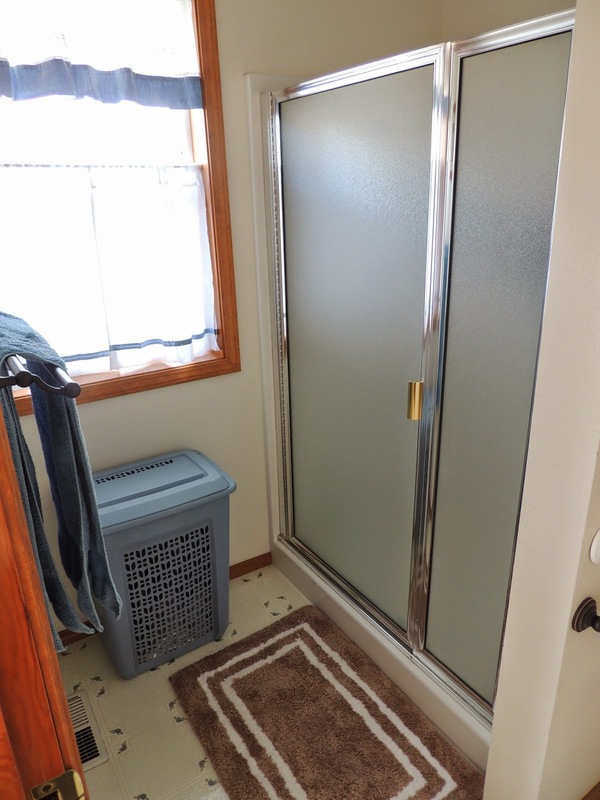 My master bathroom needs serious help. Serious. We love our house. It's only 16 years old, but we have done quite a bit of cosmetic updating the last few years. For some reason, we haven't done much to our master bathroom. Hubby offered to do a makeover for my upcoming birthday and I jumped at the chance. We replaced the faucets a few months ago because they were leaking, which led to changing the bathroom accessories to match. Other than that, it's the same as when we moved in. Soooo boring. Don't even get me started on that mirror. Love this tub. Wish I had more time for nice bubble baths! The cabinets, countertop and tile have to stay since this is a "quick" makeover. Obviously paint is a must. I have no idea why we have never painted this room. Maybe a nice shade of blue? The mirror and light fixture need to go. Maybe two smaller mirrors? We can't replace the tub faucet because the tile would have to come out. Any idea how to make it look oil rubbed bronze to match the sink faucets? Any suggestions would be welcome and appreciated by my husband, who is getting impatient with my indecision :). I promise to post pictures after we're done. Hopefully it will be fabulous! Thank you for your suggestions! We would like to eventually replace the cabinets and countertop - hopefully within the next year. I will look for something to paint the faucets. Love that tub! 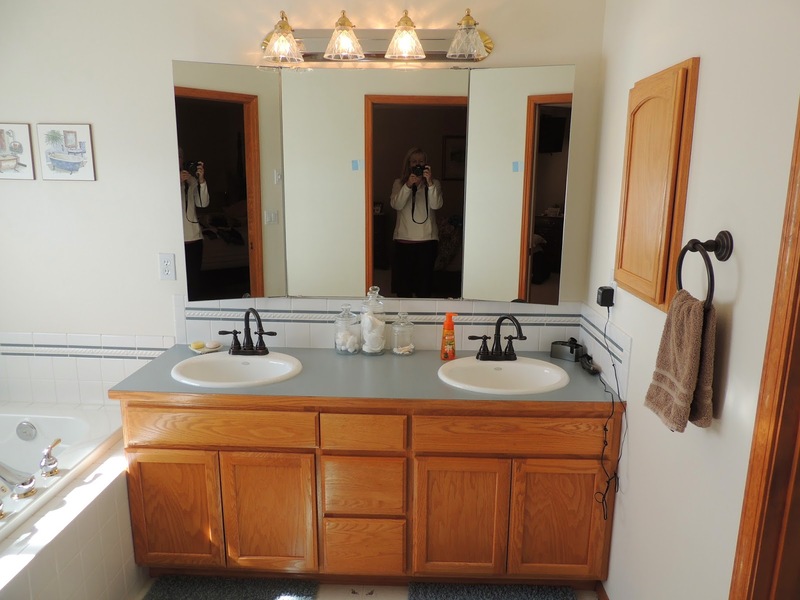 I agree, framing the mirror and an updated light fixture would help freshen up the bathroom a lot. Maybe brighter towels for a "pop" of color. I think changing the window covering would help update it too. 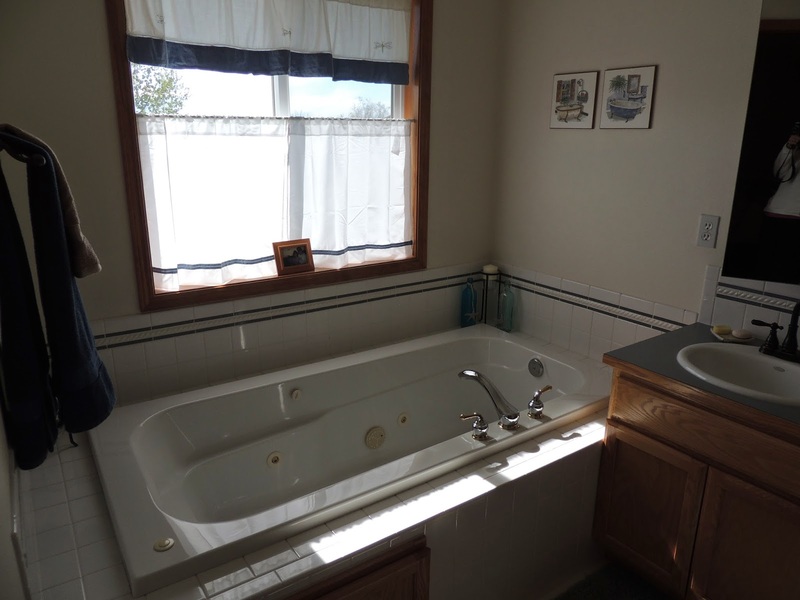 Maybe a larger picture over the tub...? I think the room has a lot of potential and you could totally do a makeover without replacing cabinets. Good luck! Can't wait to see what you come up with! Love all your suggestions - thank you! I hadn't thought about changing the window coverings. I will definitely post pictures when it's done. I would consider a bamboo shade for the window covering. 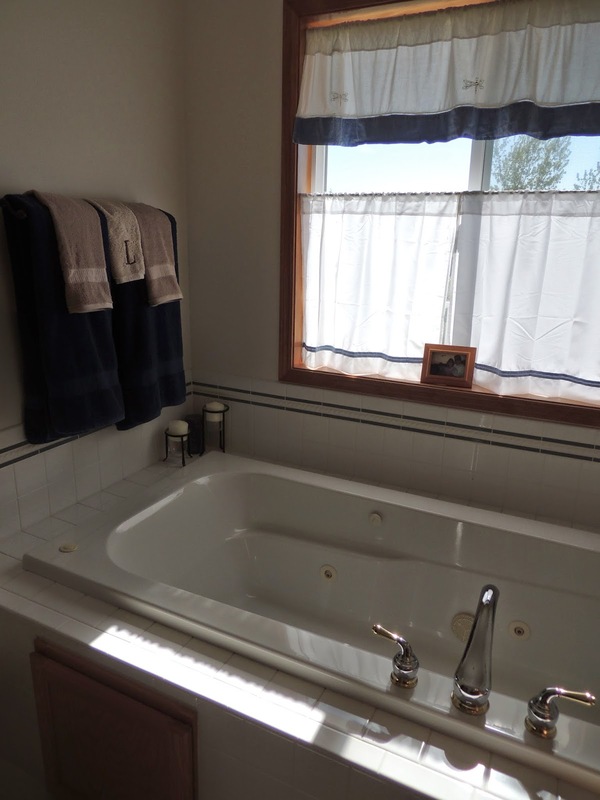 A large canvas or picture would be beautiful above the tub. Instead of replacing the entire mirror you could just put a frame around it. For paint maybe a taupe or silvery gray? I really like the idea of a bamboo shade. Thanks for the suggestions! There is a lot of directions you could go with this room. I would recommend getting inspiration for a colour selection and starting from there. I would paint and add new hardware to your main vanity but go white with the trim in the room. Those are just a few things that come to mind to get the ball rolling! Once you make some main changes you can tweak the smaller things. Good luck! Thanks for the suggestions! I like your idea of starting with the paint color and then going from there. If you're wanting a pretty blue, restoration hardware has "silver sage". It's really beautiful. Doesn't look like the name. Paint your cabinets in a coffee color oil and change the hardware on them. Also, you could change out your shower door for a "frameless" door. They look awesome. I would paint all the trim to a dover white from Home depot. Not a stark white. You'll love all these colors together. A new framed mirror and roman shades and you won't want to replace anything in the near future. Wish I lived nearby, I'd love to help! Ooh...thanks for the paint color name! I'm going to check that out. I will also look into a frameless door for the shower. I really appreciate the suggestions! I would just put silver and black accents throughout the bathroom so you don't have to change the faucet. I would also paint all the trim white and hang a bamboo shade in the window. You can do peel and stick planks for the floor, I put them in my kitchen/dining room and entryway and I love them!! They are super easy to lay and can go right over your old stuff if it's in good shape. I would also find a gray paint that matches the countertop and paint the wooden edge to match it, then it would look like a concrete countertop. If you want to do a blue in there, why not go dark and do a dark navy or charcoal gray? Or get some sticks and your hot glue gun and do this....then you don't even have to move the mirror at all! If you need more ideas, my brain is ridiculously full of them!